What is Quiet Qurl MT? Quiet Qurl MT is the most exciting technology we’ve developed. This “Muffling Technology” layer is available on any Quiet Qurl product and adds a conformable bottom side muffler to our sound control mats in multi-family construction. The core is a tangled polypropylene 3-demensional resilient structure that absorbs noise when sandwiched in a mass-spring-mass building design. A point-bonded, moisture-resistant fabric is laminated to the surface so that gypsum concrete and other materials can be placed to create a floating floor. On the bottom side of the MT version, a soft, highly compressible polyester fabric is bonded. 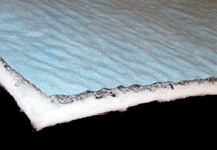 This muffling fabric almost completely compresses when installed with a 1.25” gypsum concrete floor underlayment. The compressed material adds only five hundredths of an inch to the overall assembly. Benefits include: performance like 0.75" Quiet Qurl in a 0.25" mat, cotton like layer acts to "Muffle" noise, performs from 125 Hz to 2500 Hz, 5 IIC point enhancement, and 1.25" gypsum pour, Patented Keene innovation. We have many Quiet Qurl products that include the MT (Muffling Technology) versions.